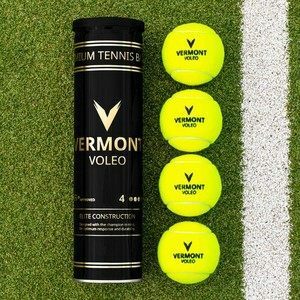 Officially approved by the International Tennis Federation (ITF), there is no denying the quality of the these mini tennis balls. 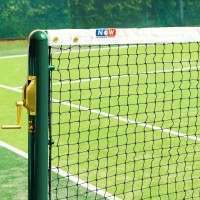 Suitable for any tennis court surfaces, they’re an excellent choice for training & tournaments. 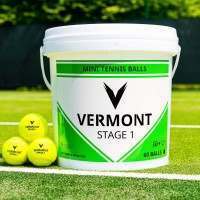 These stage 3 mini tennis balls are the perfect choice for a youngster’s development as they’re larger & softer than a regular tennis ball, making them much easier to hit & creating more shot opportunities. These high-quality Vermont Mini Red Tennis Balls come in a 36-ball capacity bucket. The heavy-duty plastic bucket comes with a useful lid & handle for simple storage & transportation. 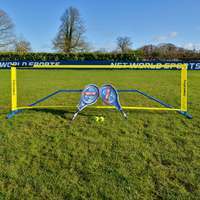 Ideal for tennis coaches. 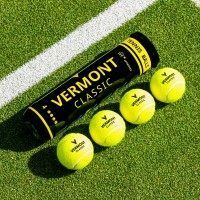 These Vermont Mini Red Tennis Balls (Stage 3) are the perfect choice of tennis balls for youngsters beginning their tennis journey. 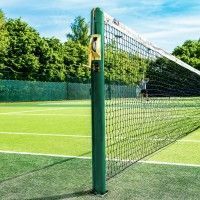 Featuring a diameter of 75mm, these mini red tennis balls are much larger and softer than a regular tennis ball, making them much easier to hit. 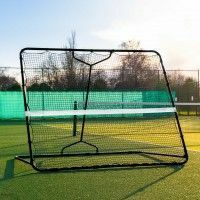 Their softness gives them a much gentler ball flight, which gives youngsters more time in between shots to recover and prepare for the next one. 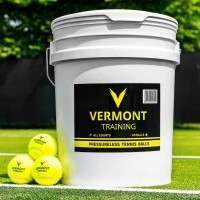 Coming in a useful bucket containing 36 high-quality stage 3 tennis balls, these short tennis balls are a must-have for tennis coaches and clubs. 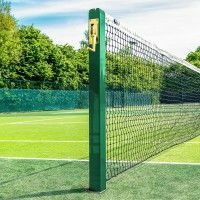 Specifically designed to an ITF specification, these mini red tennis balls will deliver an elite performance on any tennis court surface. 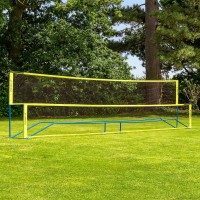 Their highly-durable construction features a pressureless core contained within an ultra-high-visibility red & yellow felt, which combine to ensure an exceptional standard is always maintained. 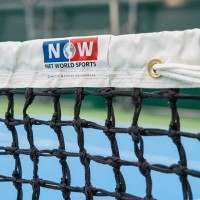 Not only does the high-quality felt improve longevity, its vibrancy makes the balls much easier to see, therefore increasing the chance of youngsters making contact with them. 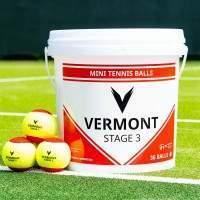 Sold in a 36-ball capacity bucket, these Vermont Mini Red Tennis Balls are an absolute must have for tennis clubs & coaches. 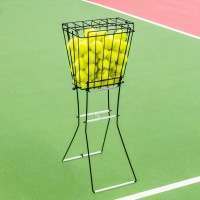 The heavy-duty plastic bucket features a lid and handle for simple storage & transportation.